I'll make it easier with my pictorial steps (FIG.1-4) above...going clockwise from top left hand corner.. Mix until a smooth dough and leave it to rest for 20 minutes. Mix into a smooth dough and leave it to rest. 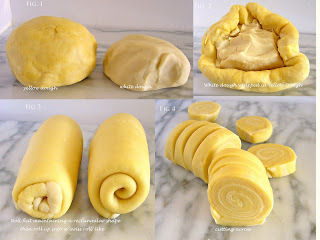 shape to a rectangular, then use a rolling pin to flatten while maintaining a rectangular shape...to thickness of 1cm. Roll up from the short end... maintaining a tight roll (like making swiss roll)... leave it to rest for 20 minutes. Fill up with the meat filling above and seal the edges. 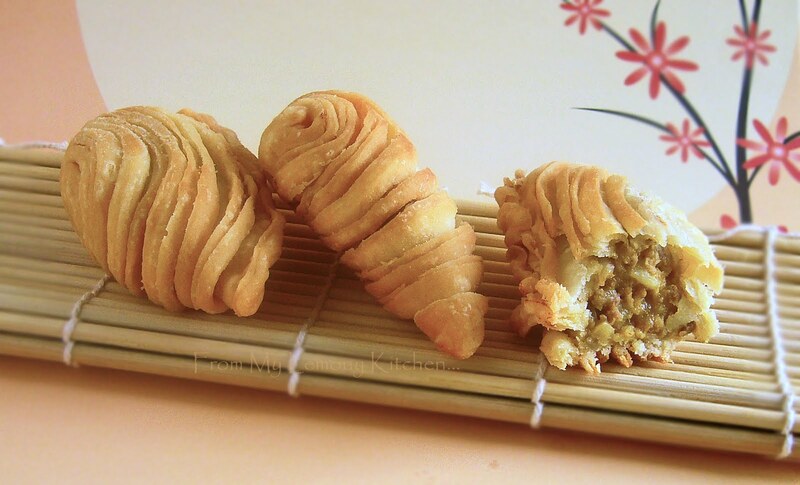 The pastry puffs look perfectly layered! Love those spiral curry puffs. You make it look easy. Must bookmark this to try. Thanks. Ehhh..... nampak sedap dan cantik. 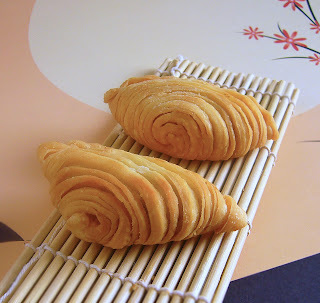 Tak pernah I buat pastry cam ni.. selalu buat yang basic punya... nak buat ni... !!! 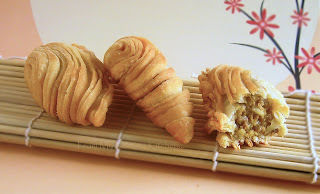 Classic pastry pun sedap juga... cuma ni banyak sikit 'lemak' dia..
and thank you for the info on the lighting for your DIY lightbox.. I was just wondering if I can substitute shortening for ghee or butter or any sort? Also, can I use butter or ghee in both dough?